THE ROHINGYA PEOPLE in Myanmar are trapped in a vicious system of state-sponsored, institutionalised discrimination that amounts to apartheid, according to Amnesty International. 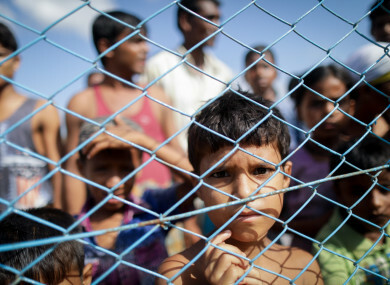 The Rohingya are a statement Muslim minority in Myanmar, formerly known as Burma. They are denied citizenship in Myanmar and are denied social and political rights. Their own language is not recognised by the state and they are left off a national list of 135 recognised ethnicities. The report – ‘Caged without a roof’ – documents recent waves of violence in Myanmar, where security forces have killed Rohingya people, torched whole villages to the ground and have driven more than 600,000 people to flee across the border into Bangladesh. The two-year investigation reveals how authorities severely restrict almost all aspects of Rohingyas’ lives in Rakhine State. It says they have been confined to a “ghetto-like existence” where they struggle to get healthcare, education or, in some cases, even to leave their village. Rohingya in Rakhine State are essentially sealed off from the outside world, facing severe restrictions on their freedom of movement that confine them to their villages. In central Rakhine State, Rohingya are not allowed to use roads and can only travel by waterways, and only to other Muslim villages. A regulation is in place that states that the Rohingya need a special permit to travel to other towns. Those who do manage to option travel passes to northern Rakhine State are met with harassment, physical assault and arrests at the frequent checkpoints. While conducting their investigation, Amnesty International staff saw a border guard kicking a Rohingya man at a checkpoint and documented at least one case of extrajudicial execution, where a guard shot a 23-year-old man dead for travelling during curfew hours. The report found that Rohingya face serious and often life-threatening barriers in accessing health care. They are denied access to Sittwe hospital, the highest-quality medical facility in Rakhine State. “I wanted to go to Sittwe hospital for medical treatment, but it’s forbidden, the hospital staff told me I couldn’t go there for my own safety and said I need to go to Bangladesh for treatment. It cost a lot of money,” one man in his 50s told Amnesty. Outside of northern Rakhine State, only a few medical facilities are accessible for Rohingyas. There, they are kept in separate “Muslim wards”. Several Rohingya described how they had to pay bribes to hospital staff and police guards if they wanted to call family members or purchase food from outside. Others avoided hospitals altogether, fearing human rights abuses from doctors and nurses, or thinking they would not be offered care at all. “Denying Rohingya access to medical care is abhorrent – we spoke to women who said they would rather give birth at home in unsanitary conditions than risk abuse and extortion at hospitals,” Colm O’Gorman, executive director at Amnesty International Ireland said. Tightened restrictions on travel have also affected many Rohingyas’ ability to earn a living and put enough food on the table. People selling products have been cut off from trade routes and markets, while farmers are often prevented from working in their fields. Malnutrition and poverty have become the norm among Rohingya in affected areas. “It is very challenging at the moment because we don’t have enough to eat,” a 25-year-old Rohingya man said. Amnesty International has concluded that the Myanmar authorities’ treatment of the Rohingya amounts to apartheid, defined as a crime against humanity under the Convention against Apartheid and the Rome Statute of the International Criminal Court. O’Gorman said: “Rakhine State is a crime scene. This abhorrent system of discrimination and segregation permeates every aspect of Rohingyas’ lives and unless there are immediate steps to dismantle it, it will remain in place long after the military campaign ends. Authorities cannot rely on hollow arguments about the need for ‘safety’ or to combat ‘terrorism’ to impose further restrictions on Rohingya. The repression is unlawful and completely disproportionate. Email “Rohingya crisis: 'We would be better in prison because at least we would have food' ”. Feedback on “Rohingya crisis: 'We would be better in prison because at least we would have food' ”.